As a Denver native, I know firsthand how much our city has changed. I used to live southeast of Parker and Arapahoe roads, which was pretty much in the middle of nowhere. The only retail at that intersection was the Barn Store and a gas and convenience store, which was where I used to ride my bike to play Donkey Kong and get an Icee on a hot day. Today, that intersection is home to several major retail centers and luxury apartments. The population of Colorado has more than doubled since my childhood, and with the influx of new residents and businesses, the cost of renting has gone up. Some of our clients have been asking whether Denver has become too expensive relative to Colorado/Denver wages. We did some research to find out just how expensive it is to live in Denver and how we compare to other markets. How much rent can you afford? Apartment management companies often qualify residents on a ratio of their gross monthly income before taxes to their rent. A common ratio we hear from management companies is three times the rent to qualify. For example, a person making $36,000 a year, or $3,000 per month, would qualify for $1,000 per month at three times his rent. The equation would be $3,000 (monthly income) ÷ 3 (qualifying ratio) = $1,000 maximum monthly rent. Percentage of income spent on rent. Another way of looking at affordability is the percentage of a household’s gross income (annually or monthly) that is spent on rent. In the example above, a person paying $1,000 per month in rent would be paying 33.3 percent of her income toward rent. The equation would be $1,000 (monthly rent) ÷ $3,000 (monthly income) = 33 percent (income spent on rent). 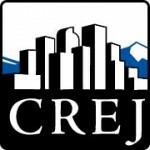 According to the Bureau of Economic Analysis, Denver has a median household income of just over $70,000. According to Apartment Insights, the average metro rent at the end of the second quarter was $1,399 per month. If we annualize the monthly rent to $16,788 and divide by the annual income, on average, households in the metro area are paying about 24 percent of their income on rent: $16,788 (annual rent) ÷ $70,000 (median household income) = 24 percent of income spent on rent. In an effort to take a narrower view of the data, we looked at one of Denver’s least expensive submarkets, northeast Aurora, which had an average rent of $1,039 per month at the end of the second quarter, according to Apartment Insights. We picked roughly the center of this statistical submarket and pulled a 3-mile radius demographic report, resulting in a $41,000 median household income. Again, if we take the annual rent divided by the median household income, residents in this submarket pay, on average, 30 percent of their income on rent: $12,468 (annual rent) ÷ $41,000 (median household income) = 30 percent of income spent on rent. In contrast to household median incomes, a single person earning minimum wage of $9.30 per hour, or $19,344 a year (assuming 40-hour workweeks and 52 weeks of full-time employment), would be hard pressed to find an option to live alone. Using a three times rent qualifying ratio, a full-time, minimum-wage earner could only afford a monthly rent of $537: $1,612 (monthly income) ÷ 3 (qualifying ratio) = $537 (maximum monthly rent). This chart speaks for itself. 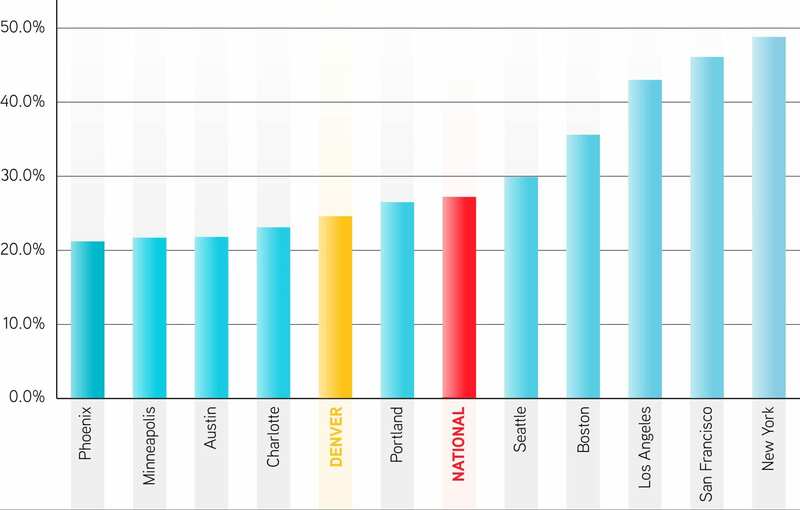 Denver is a much more affordable market than many of the other major markets across the country. Affordable demand and solutions. The chart averages only take into account apartment rents and belie the growing demand for affordability in some areas. Single-family housing prices have skyrocketed and the path to homeownership is difficult, especially for low-wage earners. Acres of trailer home communities have been bulldozed to make way for new development. Older, less expensive houses have been torn down to make way for high-density, more expensive urban development. There is a growing need to address entry-level housing, and many developers are working to tackle the problem. There are new high-quality, low-income housing tax credit projects breaking ground in many communities around the Denver metro. Creative solutions are making headway, such as the redevelopment of an old hotel and ground-up development of more affordable micro units. 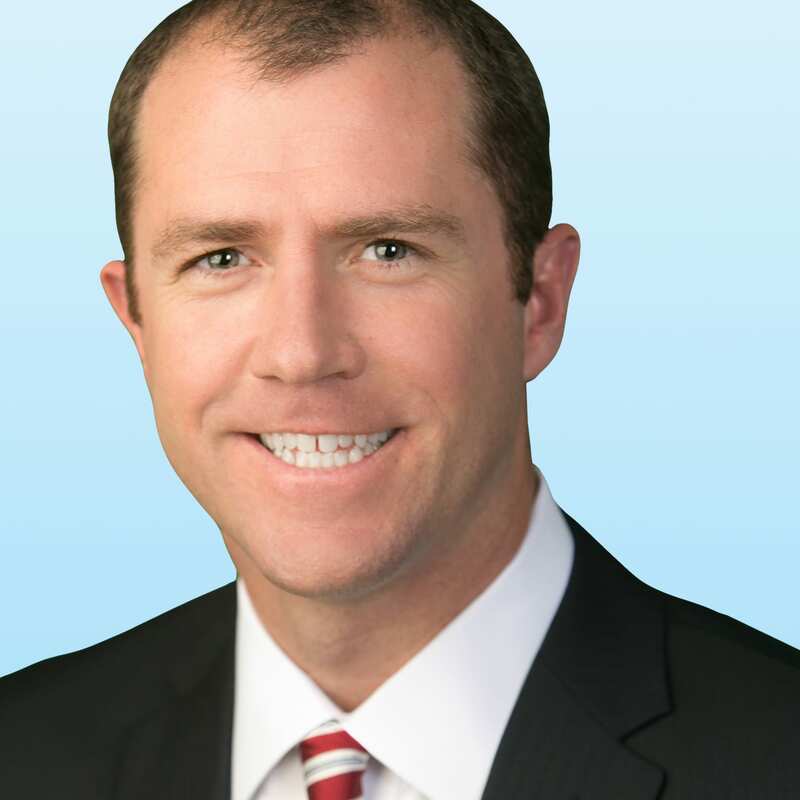 The reform of construction defect litigation laws is helping pave the way for condo and townhome development, often the first stop for entry-level housing. Hopefully, these solutions can keep pace with the demand. Overall, these statistics point to a healthy apartment market in terms of rent in relation to incomes. On average, metro Denver renters based on the household incomes are paying 24 percent of their income on rent, far less than the maximum qualifying rent and less than the national average. Given the steady influx of residents and the number of millennials still living at home with their parents, there is pent-up demand for apartments.